People will stop and stare when they see you out walking your bearded dragon this summer. Your dragon will love it too, as one hour of natural sunlight provides the same benefit as seven hours sitting under his tank lights. It's important to make sure he's secured in a harness or else he'll take off exploring and may get lost. To make your harness you'll need fabric, scissors, string and a string adjuster. 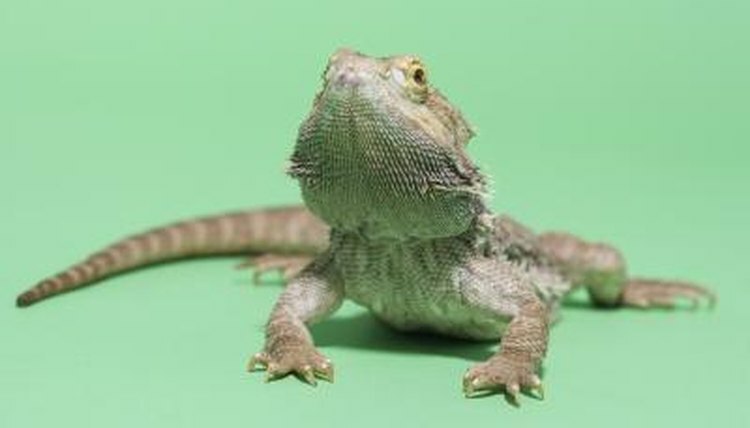 Use material that will be firm enough to keep your bearded dragon secure, but soft enough to keep him comfortable. Leather works well. Any type of string will work as long as it can be adjusted with the adjuster you have. You'll want to use an adjuster that can easily loosen and tighten so you can quickly put the harness on or take it off. A drawstring such as you would see on a hoodie works well. Measure your bearded dragon around the shoulders where the harness will go. Cut the fabric length to wrap around his body with space left between the ends so it fastens snugly with room for adjustment. Cut two holes in the fabric for the arms. Measure the distance between his arms so the holes aren't too close or too far apart. Make them big enough so they're not restricting or uncomfortable. Cut two smaller holes toward the ends of the fabric for the string. Lace both ends of the string through the smaller holes and then through the adjuster. Tighten the adjuster by pressing the button and pushing it snug towards your lizard's shoulders. Your dragon may not be keen on having a leash at first. Don't worry, because ultimately he'll be happier by getting to go outside. To help him get used to it, use the harness for short periods of time inside. As he grows comfortable with it, lengthen the amount of time. When he's ready, take him outside. Remember, your dragon will never walk beside you like a dog. He'll walk more like a cat, going where he wants and letting you follow. While the harness provides you some security, don't let your guard down. Keep on the lookout, as predatory birds may be in the area and looking for a lizard-shaped snack. Also be watchful that he does not eat wild bugs encountered outside, as many of them have harmful chemicals and pesticides which could be unhealthy. Take him outside in the summer, when temperatures are 70 degrees Fahrenheit or warmer, as that's closer to his natural habitat.